Today I'll be discussing some products I was recently sent from Karora. 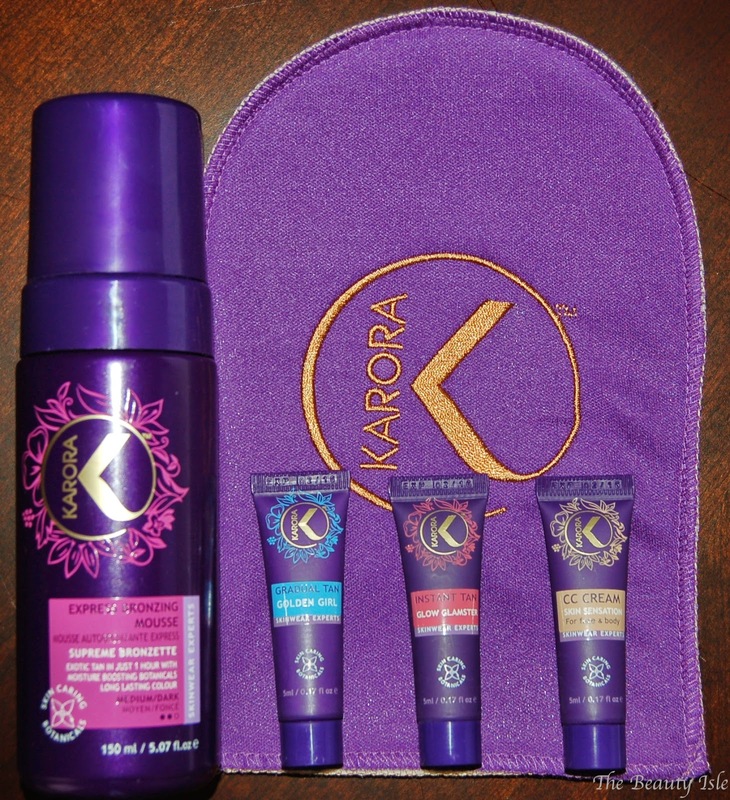 Karora is an Irish company and they recently started selling their products at Ulta. I was sent their Express Bronzing Mousse, and the Self Tan Applicator Mitt as well as a few samples. I will admit, I'm not a self-tanning expert. I have dabbled a bit a few times over the years but I always hated self-tanners because of the sticky feeling and oh dear lord, the scent. That stench is intolerable (I'm looking at you Jergens)! Get bronzed brilliance in a flash with this effortless velvety mousse which dries in seconds and develops in just 1 hour. A rapid release of rich exotic colour is infused with skin caring botanicals to deliver a faux tan with true staying power that fades incredibly evenly. This is a new breed of mousse that makes the art of self-tanning quicker than ever before while you decide your shade of bronze. The easy apply, 1 hour express turnaround time will see you red-carpet ready with a golden hue post-rinse. Take the 3 hour option for a natural looking and glamorous dark bronze, easily credited to a week of pool side lounging. You can leave this on for just 1 hour for a slightly darker look or longer for a nice bronze tan. The instructions say that you can shower after just 3 hours to get the full color benefits. The mousse itself doesn't have much of a scent which is good. The slight scent it does have is tolerable and disappears in a few minutes. I'd never applied self-tanner with a mitt before and to be honest I thought I'd be annoyed at not using 2 hands to get the job done quicker. The mitt was great, though! It really helped to spread the tanning mouse evenly on my body and I didn't feel that it took too long at all. I love the bronze look I got from this self-tanner. Even for a novice like me, my tan came out even and the look wasn't orange or fake looking. I just look like I have laid out in the sun for a few days. Of the samples I received, I tried the Gradual Tan on my face and I really love the look it gave me. I apply it at night and I wake up with a healthy color to my face. Though this color doesn't last at all, mostly because I wash the heck out of my face so any color is washed or scrubbed off the next night. Overall, I really love the Karora Express Bronzing Mousse. If you're looking for a quick, easy to apply, NON-stinky self-tanner definitely check out this product! Disclaimer: I was sent this product for review, however, all statements are 100% honest and my own.